A pro-Russian rebel leader of a region in eastern Ukraine on Tuesday announced proposals to abolish Ukraine and create a new state in its place. Alexander Zakharchenko, leader of the self-proclaimed Donetsk People's Republic (DNR), presented the proposed constitution, according to press reports. He claimed that representatives in 19 surrounding regions in Ukraine have agreed to "declare the establishment of a new state, which is the successor of Ukraine." "We are proposing to residents of Ukraine a peaceful way out of a difficult situation without war. It's our last proposal," Zakharchenko said in a statement. The new state would be called Malorossiya (Little Russia), a term historically used to describe portions of modern-day Ukraine when they were part of the Russian Empire. It is a term many Ukrainians now regard as offensive. The proposal further dictates that the state’s capital would be relocated to rebel-held Donetsk. Ukraine's current capital, Kiev, would be reduced to being a "historical and cultural center." Despite the inflated claims of support, the proposal is receiving widespread criticism from Ukraine and its supporters, as well as from some rebel groups. Zakharchenko’s comments could further undermine the Minsk peace agreement, which is already faltering. Yevhen Marchuk, Ukraine's representative in talks on implementing the peace deal, said Tuesday that Zakharchenko's declaration would complicate negotiations, adding that it looked like a Russian attempt to sabotage the process. Ukrainian President Petro Poroshenko reiterated this sentiment. He suggested the proposal was part of a Russian effort to divide and conquer his country, and said that would never happen. The Ukrainian president described Zakharchenko as being part of "a puppet show," one in which Russia is pulling his strings in order to relay a message. Vladimir Degtyarenko, leader of a neighboring rebel territory, the self-declared Luhansk "People's Republic," denied taking part in the project and expressed doubts about "the appropriateness of this decision," Ukrainian news outlets reported Tuesday. "Such decisions can only be made based on people’s opinion. Aside from that, right not we are complying with the Minsk agreements, and there's no alternative to that," Degtyarenko said. Zakharchenko’s declaration comes at a time when the Minsk peace agreement, made between the rebels and the Ukrainian government, has failed to quell fighting between the two sides. The agreement has only partially been implemented since the pro-Russian uprising broke out in eastern Ukraine in 2014. The conflict in Ukraine has killed more than 9,000 people since 2014 when Russian President Vladimir Putin annexed Crimea into the Russian Federation and pro-Russian separatists in Ukraine declared independence. 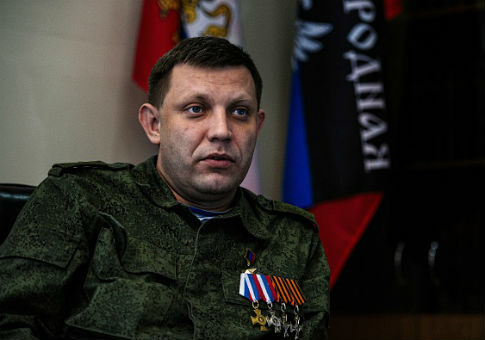 There was no immediate Kremlin comment on Zakharchenko;s declaration. Russia has not formally recognized the self-proclaimed separatist entities in Ukraine as independent. Russia has continually denied accusations that it has delivered arms and provided troops to back rebels in the largely Russian-speaking regions of eastern Ukraine. Analysts say Russia hopes to continue to use the Ukrainian rebels as long as possible in order to destabilize Ukraine and maintain pressure on its pro-Western government. This entry was posted in National Security and tagged Crimea, Russia, Ukraine, Vladimir Putin. Bookmark the permalink.